Some people procrastinate by screwing around on reddit. Others play games on their phone. Me? I like to obsess over look at gear and pretend I’m as cool as the people who actually have the time to use them (Wait, that’s me now!). The amount of time (and stress) I spent deciding on tents (this one, no that one, no definitely this one, oh a new model, no that one) definitely grayed some of my pristine brown hair that I am definitely not cutting. I herniated a disc in 2016. While I’m pretty close to being as healthy as I can be without major surgery, my back still requires that I take care of it. In backpacking, this means three things: 1) lower my pack weight; 2) use a framed pack; and 3) allow for comforts. 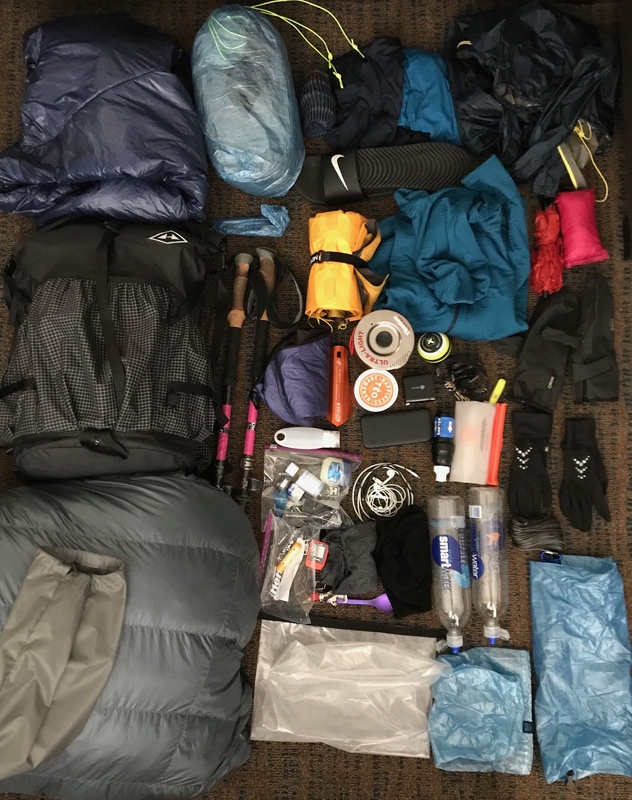 I dove into the world of ultralight gear. While my base weight isn’t technically ultralight (below 10 pounds), I aimed for ultralight gear to keep weight down. On a related note, I want to take this opportunity to whine about how much harder it is to go ~officially~ ultralight as a tall person who needs longer/wider gear that is ultimately heavier. I need great weight transfer to the hips to keep vertical pressure off my back. This makes my pack a glorified fanny pack with the shoulder straps serving the role of keeping it upright. Ultimately, I’m driving my pack weight down to allow some room for comforts. I’ll flip you off when you tell me to leave my flip flops at home. Using lineloc and 2mm paracord in conjuction with my shoulder pocket from Justin’s UL to mount my umbrella to my backpack. I’m going to look so cool. Having a lightweight, wide sleeping pad (Nemo Tensor Insulated) that doesn’t sound like a Sun Chips compostable bag. As tempting as the ever popular Neoair XLite was, I could not get over the crackling sound. Tapping a button to send “I’m OK” messages to my family on the Garmin InReach Mini. This is my first foray into quilts with the Katabatic Palisade. I set it up multiple times in the living room, but I didn’t have time for a true shakedown hike. I intentionally got the Hyperlite Mountain Gear pack in the 2400 cubic inches size rather than the larger 3400. The saying is that “if there’s space, you’ll fill it.” I was trying to force myself to pack smartly. As I get closer to departing, more and more items make the cut out of fear. As a result, it will take creative use of exterior space to make everything fit, especially once I add food. Obsessing over gear is fun, but it’s far from everything. I need to note that gear is such a prominent part of my focus pre-hike because it’s one of the few things I can control now. I can’t know what it’s like to be rained on for a week straight from my computer screen. What I can do is research the technology that will make life a little easier on the trail. I start the Approach Trail tomorrow. This post is my means to get some nerves out. I’m ready. I'm Stephen! On April 8th, 2019, I'll start my NOBO AT thru-hike. I'm a Houston native that accidentally fell in love with mountains during graduate school in Colorado. I left my job as a geologist in the oil industry back in Houston to get closer to mountains (and my girlfriend) in Utah. While finding life's next step, I'm going to take a couple million towards Maine. Don’t bring an umbrella. For real! This is a mistake I’m excited to make. If I don’t use it, I’ll send it home! Hey, I did a SOBO hike last summer. Read your article, wanted to wish you luck, caution you to mock up your bag, with food, water, exterior space utilized the way you want, etc… I wish I had before my trip. Having ANYTHING on the outside of your pack is really obnoxious, especially in New Hampshire and Maine. You get snagged on everything. Hey, thanks for the advice! I’ve done several day hikes/walks around town fully geared, though admittedly sans food. I managed to get everything with room to spare. I know food is another animal on its own, but I think I have it under control! I wish you the best of luck, and safe travels. Your future shelter/campsite mates thank you in advance for not bringing the ear-invading nightmare that is the Neolite pad, Lite or otherwise. I still can’t believe anyone brings that bag o’ chips along when other people’s sweet dreams are at stake.